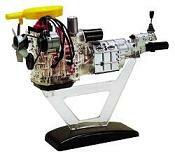 Minicraft makes this 1/5 scale (over 12" long when completed) working visible rotary engine model kit. The Aoshima model above is also 1/5 scale, but it is 1/5 scale of a rotor. This is 1/5 scale of the entire engine and transmission. It is molded in color and comes with a display stand. The metal starter motor actually turns rotors, and the spark plugs light up! These great 1/43 scale (4" long) diecasts are highly detailed and of exceptional quality. They even come with a FREE acrylic display. Yellow was only released in a Japanese version RHD car. This is a 1/38 scale (5" long) diecast. The doors open, and it has pullback action. Click for more photos. 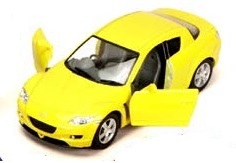 High quality, 1:43 scale diecast (4" long). Come with a FREE acrylic display case. Click for larger photo. Excellent quality 1/24 scale plastic model kit of the Efini 3rd Generation Mazda RX-7 by Tamiya. Paint and glue required. 6" long when assembled. Amazon is selling new copies for $600 each. Only 4 new copies remain on the planet, so once they sell out, that will be it - forever. Of course your copy will be signed by the author. For 1st, 2nd and 3rd Generation Mazda RX-7 cars. You won't find any of the advertising-driven hype you read in magazines. Find out the truth about rotary performance! The first of the Wankel engines were produced as outboard motors in the mid-fifties. In 1963 the engine was put into a small sports car and later came the Mazda Cosmo Twin-rotor GT. This book charts this car from its introduction in 1967. Click for more info. 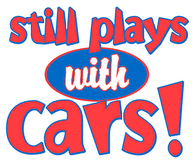 Available in 4 colors, click the cartoon RX-7 image at the left to place your order! This is an awesome DVD. If you are in import tuning fan, then you will love it. Also, it is in English (Japanese accents only). Titled: Impreza vs. Lancer - THE FINAL BATTLE, this Best Motoring DVD features the IMPREZA STi Spec C, EVO VII RS, Tuned GC8, EVO II,Tuned GDB, EVO V, Mazda RX-7, Nissan Skylines, Toyota Supras, and more. The latest Best Motoring DVD is titled: THE 350Z SHOCK. Must viewing for all Nissan 350Z fans, but highly features Altezza, Skyline, Silvia (S14 and S15), Supra, RX-7, Civic and Euro Accord.